- Two station unit wooden work bench, lamp and tools drawer. - Clean system with dust collector. - A built-in silencer help keep operation quiet. Two models available. Model 1/2 HP 220 V.
Model 1 HP 380 V.
Exhaust Motor: 1 HP 380V. Dimension: 76 x 110 x 125 cm. 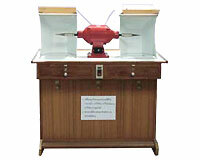 Polisher Motor: 1/2 HP 220V. Exhaust Motor: 1 HP 220V.